It’s that time of the year again, women’s month is in the horizon and what better way to celebrate a force that is a woman than to host an all female cast THUD (SheTHUD)? Join The Hook Dinner again on the 2nd August 2018 as we celebrate Basotho female trailblazers who have discovered their unique selling proposition and are applying themselves to effect change not just in Lesotho but regionally and globally as well. 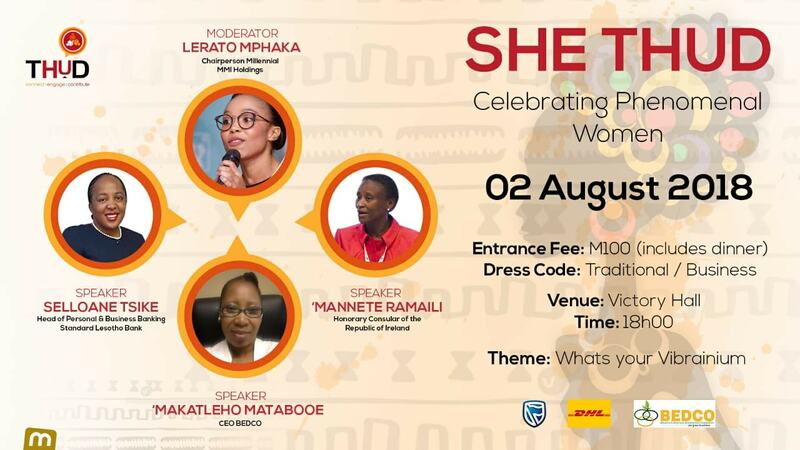 THUD will be at Victory Hall graced by a panel of one of the country’s female thought leaders; Lerato Mphaka, Selloane Tsike, ‘Mannete Ramaili and ‘Makatleho Matabooe. numbers – 58700199 & 62433674 respectively.